Inverness say midfielder Greg Tansey chose to stay in the Highlands following an approach from Aberdeen. The Dons were baffled by Caley Thistle's unwillingness to allow the 27-year-old to speak to them after they submitted a £200,000 bid. Aberdeen manager Derek McInnes thought their offer would trigger a contract release clause. But Inverness insist the player is content to remain with them and say the late bid was "unwelcome". McInnes said Aberdeen were "surprised and disappointed" that their offer had been unsuccessful. He was of the opinion Tansey had been keen to move to Pittodrie and added that he would welcome an investigation into Caley Thistle's failure to heed the release clause. 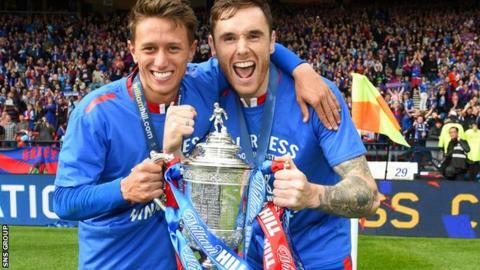 Inverness responded with a statement reading: "Aberdeen FC made their official approach to us on Saturday evening in relation to an offer for Greg Tansey. This was followed by a period of activity, culminating in their final offer on Monday afternoon. "This was an unwelcome and late approach for a very popular and influential player within the club. "However, after meeting with Greg following the final offer we were delighted to be assured by him that he is happy in Inverness and that he had elected to remain at Tulloch Caledonian Stadium and we thank Greg for his integrity, honesty and loyalty to the club. "The club then informed Aberdeen FC that their final offer had not been successful. "In the period after Aberdeen FC making official contact with us, we were of course determined to act in the best interest of Greg Tansey and our club and we are confident that the outcome will be warmly received by our fans."